Dr. M.S. Gupta, MBBS, MS (Orthopaedics), is the Co-founder and Consultant Orthopaedics at Raffels Hospital, Panchkula. Prior to that, he had career stints as Registrar at Edinburg University(UK) & Visiting Consultant at UTMB university,Texas, USA. Dr. Gupta is an alumnus of Government Medical College, Rohtak from where he completed his undergraduate degree. 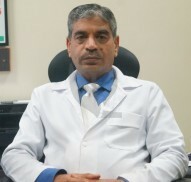 Subsequently, he completed his post graduation(MS) in Orthopaedics from the world famed institute of post graduation PGIMER, Chandigarh in the year 1981. Besides, he also attained fellowships in Joint replacement from Germany, Australia & Thailand. Dr. Gupta was honoured with Bharat Gaurav Award in the year 2000. He has performed more than 500 joint replacement surgeries. Over and above, he has to his name various publications in JBJ, British Journal. Apart from this, he has presented more than 20 papers in various national and international journals. Always in strive of knowledge, he has attended more than 70 conferences in India and abroad.